An Egyptian who used to work as a low level handler of mercs working for the dynasty. He had run Asp on some jobs before. He was on the losing side of the schism and fled to Mars. 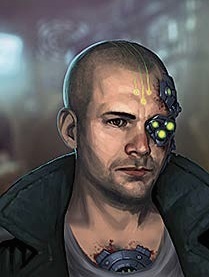 His missing eye has been replaced with a glowing red cyber-eye. He runs a bar called the Red Delta attached to the Hathor temple, and is known as the man to see in Heliopolis if you’re looking for some rumors and loose talk. Of course, he expects a donation to the temple first…. Recently helped the team with info during their raid on Thutmose. Also, is apparently a fan of Ares’ semiautos. Killed by the bugs when they took over.